Puppy Names: Cute, Unique, or Traditional, You Choose! Looking for cute puppy names? You're in luck! 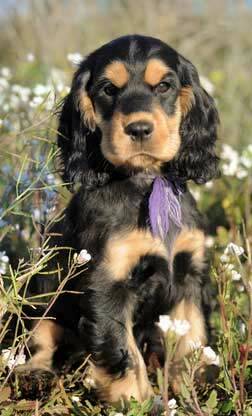 Our database can help you find something really special for your new Cocker pup. Just scroll down and click on any of the links. Go ahead and take a look - we don't bite! Deciding on a special name for your new Cocker puppy is such an exciting time! Finding names for your new puppy is easy, there are many websites listing thousands, but when it comes to finding one that's perfect for your little fur-ball baby, you'll probably want to take your time and choose something really special. Many of today's dog names are unisex, with a few exceptions of course, but if you prefer traditional names for boys and girls, I've categorized them into separate lists of names just for boys and some exclusive to little girls too. It seemed to take forever, but I do hope you feel it's been worth it! Just follow the relevant links further down the page. Whether you're looking for traditional, unique, or unusual dog names, I'm certain you'll find the perfect name for your Cocker right here in our database! If you'd like some tips on choosing puppy names, I recommend you bear these helpful suggestions in mind as you work your way through our directory. Cool Dog Names For Cool Dudes! If your dog's a cool dude, and I'm sure he is, then these are for you! And who wouldn't enjoy browsing through hundreds of cool sounding puppy names? Just click on any of the puppy pictures below to find something to help you name your new pup. Let's face it, all puppies are cute! There's no disputing that fact, so it's hardly surprising that owners are looking for really cute names for their Cocker Spaniel puppy. I'm often asked to come up with examples of cute names for puppies, so I canvassed our visitors for their opinions. I also added what I considered to be cute and once again separated them into three pages; unisex, one for boys and another for girls. Take a peek and see what you think - just click on any of those photos of cute Cocker Spaniel puppies above! When I was searching for unique names for both girls and boys, I came across so many that I felt sounded unique, or at the very least, unusual, but I'll leave that up to you to decide. Unique dog names for little girls! Unique names for little boy puppies! Many may be used for both sexes, but for the traditionalists, you'll find separate pages of unique names for boys and names for girls. Admittedly some are more original than others, but I discovered many that would suit our Cocker Spaniels' personalities just perfectly. Choosing a name for your little boy while he's still very young could mean that you lose out on matching his name to his personality simply because it's not had time to develop yet. Your puppy's emerging personality may give you just the inspiration you need! However, at the end of the day, choosing puppy names is entirely a personal choice - go for it! If you've reached this far and still not found anything you like for your little girl (and I find that hard to believe with so many scrumptious names), I think you'll find the above linked pages are packed to the brim with some really sweet-sounding names for your precious little girl. Personally, I like feminine-sounding names for little girls, like Jasmine, Sasha, or Purdy, but as I said earlier, it's personal choice. Take a look around, you'll find so many precious names you'll probably have a hard time picking just one - have fun! Why not try a few on for size? Try to keep your list to around 15 if you can, because if you're not careful, you may end up having to short-list your short-list! Try each one on for size - say it out loud and if you like the sound of anything in particular, add it to your list. When you've a decent selection, you and your family will be ready to make your choice. If you simply can't decide on one particular puppy name, why not place your family's favorites into a hat and ask Grandpa to pick out your pup's name from the hat? There's no rush - take your time and enjoy!